Red Angel across from 27 Rue de Fleurus, 2013, SX-70 Polaroid. 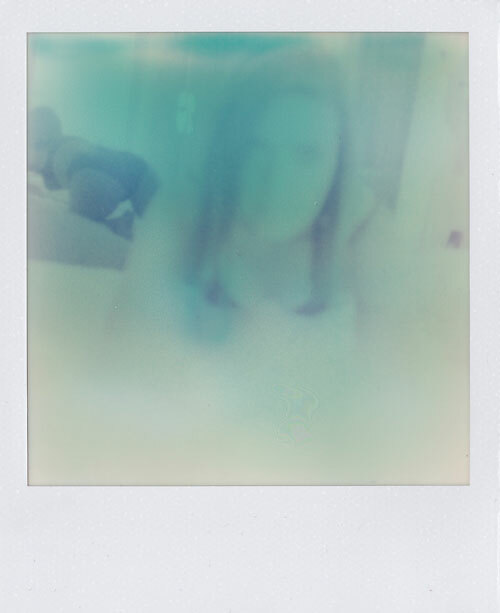 Singular Plural, 2010, SX-70 Polaroid. That Skin on the Surface of the Milk, 2012, SX-70 Polaroid. In the five major photo-based projects I have been working on over the last decade—Shame’s Glove, Kissing on Main Street, Four Sisters, Intimographies, and Her Lover’s Shadow…Traces from the Snuff Box Archive of Desire—I have been meditating on the aesthetics of intimacy, the creativity of shame, the questions of the aesthetic form and the ethics of how to tell, how to show, and how to listen attentively to a life, and how to approach both the desire to create alternate forms of life and life practices (queer modes like that of the “spinster”) and the wish to develop a means to die (that is, something like the “good death”). I’ll admit, though not without a little tinge of shame, that when, in the context of couples counseling, I described how I used to visit my great aunt Lis every weekend while I was at university, the therapist declared, “That’s not normal. That’s bizarre.” This affectively not normal or bizarre is an image of myself I have spent not a little time trying to reclaim through not just my archival research and but also my profoundly interlinked photographic practice and the practice of queer theorizing across my writing, teaching, and work with the resurrected dead technology of the SX-70 Polaroid. The practice of photography, like my ongoing passionate attachment to queer theorizing, is a love affair I began in graduate school. Such an admission is actually not without the flush of shame. And this is not merely because I have spent the last two and a half decades exposing myself in front of the camera—from 1991 to 2002 as part of the photography and performance collaborative SPIR with María DeGuzmán and then, since 2003, in solo thinking, writing and performing with and through images. I trace the burn and blush of shame on my cheeks to the many ways that the cultivated, highly composed narcissism of posturing for the camera, for my cameras, constitutes an ongoing but fraught effort to work out a deeply vexed relation to the femininity in which I was trained. These photographic performances do nothing to reduce the shame of refused return or the return that is quite other than desired, the shame of a refracted reflection that does not give back or does not give back what one may desire to see and feel. Such burns of shame converge not just in the scenes of my own workings out (if not through) with the camera but also in my in-progress book project The Volatile Image: Other Histories of Photography as the “I” that practices photography insinuates itself into the scene of theorizing and historicizing the photograph and its powers. Thinking with Adam Phillips and Leo Bersani’s notion of impersonal intimacies or the relational possibilities between strangers (articulated in their book Intimacies), and Eve Sedgwick’s concept of shame as not just folded with pride but a resource of flaming creativity (developed in her book Touching, Feeling), this intertwined practice-based, theoretical and historical project understands photography as a performative and relational practice with not just psychic but also social and political consequences for imagining and enacting the livable life and an approach to death. These meta-photographs that reflect on photography are engaged in a practice which I call pyrography. While photography literally means “writing with light,” this is work that writes with the heat of shame, the intensity of utopian desire within the constraining bounds of the normative, and the flame of an audacity that refuses to be limited by them. The pierce of pyrography is the reminder of the naked precariousness of the wishes and the offers they expose, the many ways in which, in the contacts the photograph enables and performs may go amiss, the ways such photographic encounters may misfire, be mistaken, and missed. What I am getting at is that I think—and I will risk saying that I feel—pyrography operates as the kind of affectively, psychically, and politically-charged stage-set, but one that, as such, opens the queer space of the photographic encounter to and for volatile transformation. But the results remain open and, thus, precarious for the photograph is not a once-and-for-all shot in the dark room but a molten process that also depends on you.